This would be a great project for kids who are just learning to hand sew, and if you’re anything like me, you may be able to raid your stash of extra office/school supplies and random craft supplies to make these without even having to run to the store! Cut your felt to the size of your notebook, leaving 1/4″ on each side for the stitching. You’ll need one large piece for the outside of the notebook and two smaller pieces for the inside flaps (which hold the cover in place). 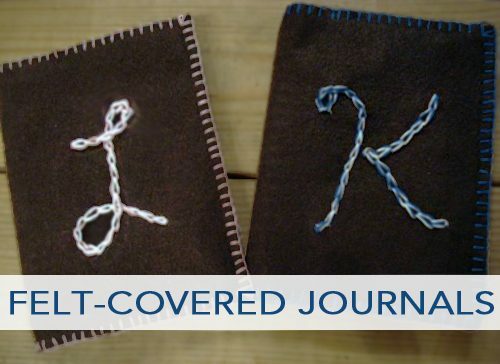 Trace an initial or shape on the cover with chalk and then stitch using a chain stitch. Pin the felt pieces together and stitch together with a blanket stitch around the outside edges. Be sure to leave the flaps open so that the notebook can slip into the cover. Add a felt applique to the cover instead of embroidering letters. Use quilted material rather than felt.